One of Africa’s greatest safari destinations, the 22 000-square kilometre wilderness of Etosha National Park is a top highlight for many travellers to Namibia. Made up of grasslands and woodland savanna and dominated by a giant salt pan, Etosha is home to 114 species of mammals, including four of the Big Five and the world’s largest concentration of black rhino. A visit to Etosha during the dry months of June to October means you’ll be treated to some of the best wildlife viewing that you can have on the continent. The lack of rain forces animals to congregate around the waterholes spread out in the park, so seeing black rhino, herds of elephant, prides of lion, as well as herds of zebra, giraffe and springbok takes no more effort than parking next to a waterhole and waiting for the animals to arrive. The rainy summer months have their own appeal though: at this time of year, the vegetation is lush and green, and for keen birdwatchers there are the million flamingos that use Etosha as a breeding ground, and the host of migratory bird species that make the park their temporary home. The best experiences in Etosha are all about spotting wildlife at waterholes during the dry winter months. There are a number of them which are spread throughout the park near to accessible roads, so all you have to do is park your car, sit with a flask of coffee and wait for the animals to arrive. Each of the camps inside the parks features a waterhole that you can sit around for hours in the afternoon doing the easiest wildlife viewing possible. Of all the camp waterholes, Okaukeujo waterhole (at the camp of the same name) is a stand out. 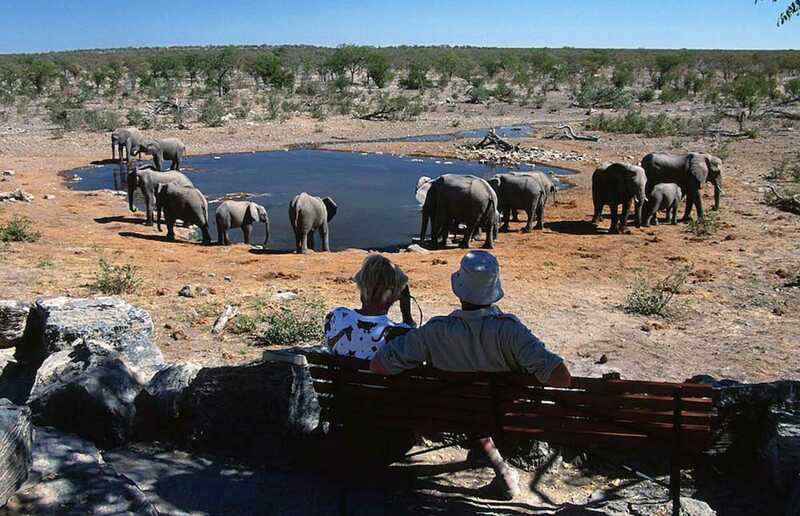 There’s a low wall around one side of the big waterhole so you can sit on a bench just a few metres away from a herd of elephants having a mud bath: Etosha magic at its best. Etosha is a perfect choice for a self-drive holiday: the roads are easy to navigate and are in very good condition – and suitable for 2WD vehicles, although you might prefer a 4WD for better visibility.